Elegance and sophistication are just two words to describe theSavona Collection. Featuring a distinctive, geometric design with unique vertical handle and polished chrome legs, it's sure to add a sense of modern, European flair to your bath. 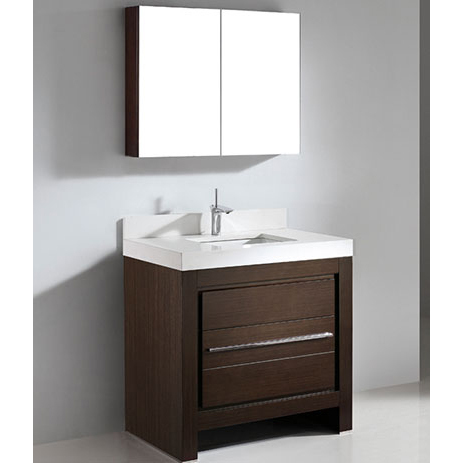 The beauty and warmth of the polyurethane protected solid wood veneer with Walnut finish accentuate its timeless design, and sets off the beauty of the integrated counter and basin – available in your choice of Roman Cream natural stone, Quartzstone, six-color glass top or pristine white ceramic designed to match your own, distinctive style. Two soft-closing doors open to a spacious interior and a concealed interior drawer.